Director – Arthur Hiller, Screenplay – Steve Shagan, Bud Shrake & Martin Cruz Smith, Based on the Novel by Martin Cruz Smith, Producer – Martin Ransohoff, Photography – Charles Rosher, Music – Harry Mancini, Visual Effects – Carlo Rambaldi, Special Effects – Milt Rice, Makeup – Del Armstrong, Production Design – James Vance. Production Company – Polyc International. Youngman Duran, a native deputy on a Hopi reservation in Arizona, investigates a series of cattle mutilations. The attacks soon start spreading to humans. Duran is caught between Western law and his traditional beliefs and is unsure whether to take seriously the claim that the attacks may have been called up by an embittered medicine man who died promising to end the world. At the same time, an English scientist Philip Payne appears warning that the killings are being caused by a horde of vampire bats infected with bubonic plague. Duran and Payne join forces as the bats move across the reservation, infecting all in their path. Nightwing is a film based on the fifth novel of author Martin Cruz Smith. Subsequent to Nightwing, Cruz Smith became best known for Gorky Park (1981) and the ensuing series of books featuring Arkady Renko, a detective in Soviet Russia, as well as various other thrillers usually set in exotic locations. When he published Nightwing (1977), Martin Cruz Smith was a relatively unknown author, but through judicious marketing the Nightwing book was able to exploit the then success of Jaws (1975) where it was promoted as another Nature’s Revenge story and duly became a bestseller. This film of Nightwing was made under the directorship of Arthur Hiller. While well produced, Nightwing is leaden and proved a flop. Indeed, Nightwing was a nail in the coffin of the now-almost-almost forgotten career of Arthur Hiller who once rode high with films such as The Americanization of Emily (1964), The Hospital (1971) and Silver Streak (1976) and was even Oscar-nominated for Love Story (1970). Since then, Hiller has seemed a spent force and only churned out dreary comedies like The Lonely Guy (1982), See No Evil, Hear No Evil (1989), Carpool (1996), Pucked (2006) and the notorious turkey An Alan Smithee Film: Burn, Hollywood, Burn (1997). Certainly, the Nightwing book is a highly readable and the film is even co-written by Martin Cruz Smith himself. However, in the film the vampire bat menace of the book has been subsumed in favour of a heavy-handed polemic on the state of the modern tribal Indian’s corruption by Western values. All of this was there in the book but Martin Cruz Smith deftly balanced the message-making with an engaging story. On the other hand, Arthur Hiller appears almost entirely disinterested in making a monster movie and the bat menace is placed on the backbench. 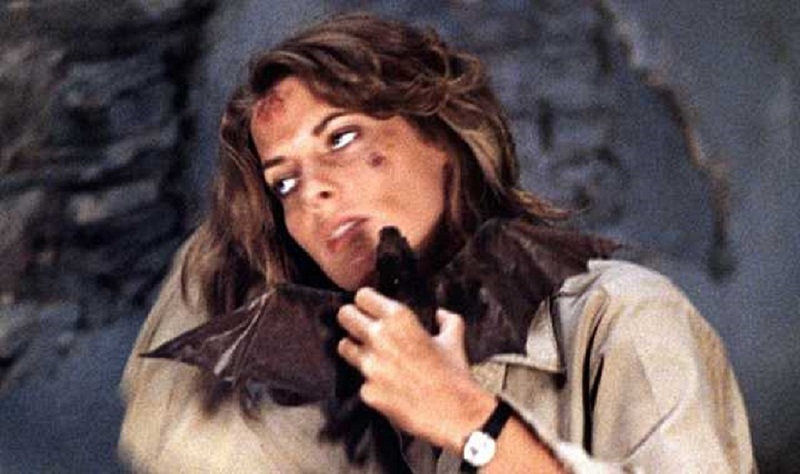 The bats, when they eventually do appear, brought to life by Carlo Rambaldi, the man behind the notorious mechanical King Kong (1976) hoax, are a poor mix of obviously flapping mechanical models and shoddy rear projection. Although if one can ignore this, one scene with Nick Mancuso, Kathryn Harrold and David Warner sheltering behind an electrified cage in the middle of the desert as thousands of bats close in and the battery powering the cage starts failing, is a slightly evocative scene amid Arthur Hiller’s almost entirely suspenseless handling elsewhere. There is an occasionally interesting trompe l’oeil duality that Nightwing works on, sitting between an Indian mystical worldview and Western rationalism, with Nick Mancuso’s Westernised deputy caught between both cultures as to whether to interpret the bat menace as supernatural or scientific and whether the reappearances of the dead medicine man are real or datura hallucinations. The performers that Arthur Hiller casts – Nick Mancuso, Kathryn Harrold and Stephen Macht – all then unknowns, prove stolid and never animate the human element. Nightwing is worth comparing to the very similar Prophecy (1979), which came out two months later the same year. Both films tapped into the Nature’s Revenge cycle that had been created by Jaws and both married a Nature’s Revenge movie to 70s liberal concerns and took up the issue of impoverished plight of the Indian nation. Both also showed that all the fun of the monster movie could be bled out when the filmmakers started taking the films too seriously and offering up tub-bashing messages in lieu of scaring audiences.